Clapper's Cavern is the thirty-first level of Donkey Kong Country 2: Diddy's Kong Quest. It is also the fourth level of K. Rool's Keep, but was moved to being the third level in the Game Boy Advance port, making it the thirtieth level in that version. Clapper's Cavern takes place in an icy cavern. It shares some similarities with Slime Climb in that the water rises, and a Snapjaw is chasing after Diddy and Dixie Kong. Because the Kongs cannot safely enter the level, they must rely on Clapper the Seal's assistance. Unlike Clapper's first appearance in Lava Lagoon, the Kongs can jump on it to freeze the water and safely go across. Diddy and Dixie must quickly cross the ice as it melts quickly, leaving them vulnerable to the Snapjaw again. Krunchas and Zingers are the most common enemies in this level. Krunchas can be difficult to pass safely unless the Kongs use a Team-up attack. In various parts of the level, the Kongs need to gain momentum on the ice and then duck to slide beneath the Zingers, whether it is for collecting items or to progress through the level. Midway through the level, the Kongs can swim through a section without being followed by Snapjaw. At the start of this section, they can open an Animal Crate containing Enguarde the Swordfish. In the Game Boy Advance port, the level background was changed from purple to bright pink. At the start of the level, the Kongs must continue right, and can find Clapper along the way. They then need to jump on him to make him cool down the water. Once it is frozen, they can walk on it, avoiding the Snapjaw below them. Quickly, the two monkeys must run across the ice, jumping over Zingers, before it warms up and becomes a liquid. 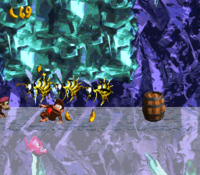 Once back on land, the Kongs must avoid a few enemies and jump on another Clapper, who freezes the water again. As they run across the ice again, there will be a few Neeks and some Zingers to jump over. Afterward, the heroes must walk into the nearby barrel that shoots them up to a higher part of the level. From there, the apes need to travel west and jump across two small gaps, then jump on the third Clapper to cool the water down. At that point, they must jump over a group of two Zingers and also slide under another Zinger. There is a barrel that the Kongs must go in. It shoots them up to an even higher area of the level, where the Snapjaw will stop pursuing the Kongs, and the Kongs can get on Enguarde, the Animal Friend. With the swordfish, they should ride north through a wide crevice and shortly after, pass a No Animal Sign sign, making them lose their Animal Friend and exit the water alone. Diddy and Dixie then need to jump across a rather small gap and break the Star Barrel. Halfway through the level, another Snapjaw will make an appearance, requiring the Kongs to jump on a Clapper, and run across the ice again. There, they have to fight or avoid many enemies, such as Neeks and Zingers. Once they reach land, they need to carefully avoid some enemies and hop on the chains to reach the highest part of the level. Here, the group must jump across a gap and land on a Clapper, freezing the water yet again. When running across the solid ice, Diddy and Dixie need to avoid some enemies and even slide under three Zingers, then quickly jump on another Clapper. Still on the ice, they must jump over or slide under many Zingers until they reach the End of Level Target, whose prizes include a Banana, a Banana Bunch, or a Banana Coin. There is a large variety of enemies in Clapper's Cavern, most of them being Zingers. 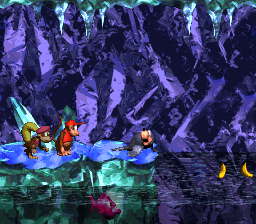 At the very start of the level, Diddy and Dixie must use Team-up to reach a hidden hook directly above them. The Kongs must then jump to the second hook and then continue heading right on an icy platform. From there, they must pass four Spinies and a Klampon and walk into an opening leading to the first Bonus Area. Here, the Kongs have twenty seconds to hop from six icy platforms (each having a single Banana on them) until reaching the end platform with three Bananas and the Kremkoin. The nearby location of both the DK Coin and the Golden Feather. DK Coin After passing the letter K floating above a Zinger, the Kongs must stand on the following platform with a Kruncha and use Team-up at an opening above them. From there a hidden hook appears, and the Kongs must jump onto the icy ground and continue left. At the dead-end is a visible hook, also only reachable via Team-up. The Kongs can jump from the hook to obtain the DK Coin. Alternatively, the Kongs can also spawn at the dead-end from completing the first Bonus Area. Golden Feather (GBA version) The Golden Feather is very close to the DK Coin. From the DK Coin, the Kongs must go slightly right and use Team-up into an opening. The thrown monkey can collect the Golden Feather this way. Photograph (GBA version) There are two photographs in this level. Just before the location of the second Bonus Level, the Kongs and Enguarde find three Puftups. The middle Puftup has a photograph over its head, and the Kongs can obtain it by stabbing it with Enguarde. This photograph adds a picture of Puftup on the fourth page of the Scrapbook. Right after the letter N, the heroes can find a lone banana floating in the air. They must use Team-up to obtain the Banana, revealing an Invincibility Barrel. With their invincibility, the Kongs must swim down a corridor to the left to obtain the photograph along with three Banana Coins and some Bananas. The photograph is of Clapper the Seal, on page 15 of the Scrapbook. It is the last photograph that appears in the Scrapbook. There are two letter K's: one of them is floating above a Zinger near the start of the level. 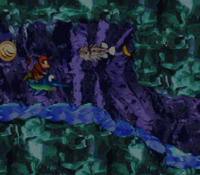 The other one is located just before the DK Coin, appearing directly above the Kongs after they exit from the first Bonus Area. Located to the left of two vertically-sorted Zingers. After the Star Barrel, the Kongs must jump onto Clapper and then run across the large sheet of ice. As they continue across the ice, they notice the letter N beneath a Zinger, only obtainable by ducking and sliding beneath it. Shortly after obtaining the letter N, the Kongs must continue upward by jumping from four hooks. The letter G is floating high above these hooks. This page was last edited on April 6, 2019, at 02:39.